The Magnetic Pulser generates a pulsed DC magnetic field. The pulsed magnetic field creates gentle microcurrents of electricity. Microcurrents work with the body’s own natural electricity. 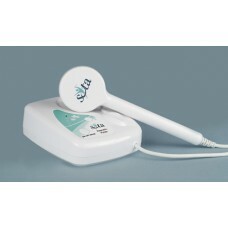 In addition, the Magnetic Pulser offers the health effects of magnetic energy. The pulsed magnetic field creates a flow of electrons. The Hand Paddle of the Magnetic Pulser can be held over any area to generate microcurrents. There are two types of magnetic fields: 1) Fields created by a pulse of electricity through an electromagnetic coil and 2) Static magnets that create magnetic fields by the natural alignment of the atoms. Many of us witnessed this in school—the field of a magnet moved iron filings in a pattern to display the magnetic field. The energy of static magnets is identified as either North Pole or South Pole. The Magnetic Pulser offers the benefits of both a pulsed magnetic field and static magnet field as the unit outputs a North (-) Pole and South (+) Pole. The North Pole is usually recommended, as the South Pole can be stimulating.